The great thing about WordPress is just how easy it makes it to set up a website and then maintain it going forward. WordPress can be installed incredibly simply, essentially through a single click. What’s more, is that it then gives you access to a wide range of plugins and themes that can instantly change the appearance and function of your site. You’ll also have a massive support network of people who can help you if you run into any technical difficulties and new updates will continue to improve the security and the admin panel without you having to do anything yourself or pay a single dime! But while WordPress does a lot for you, one thing it can’t do is to choose for you. You’re still going to need to make the decision as to what kind of theme you want to use, what logo you’re going to create and what color scheme you want. And this is when all of that free choice can actually end up being a double-edged sword. With so many themes to pick from, how can you possibly choose yourself! The good news is that finding themes is very easy and you effectively have three different options. One is to look on WordPress’ own theme store. To do this, head into your WordPress admin panel (www.yoursite.com/wp_admin) and then go to ‘Appearance’ down the left. This will bring up the option to go to ‘Themes’ and from here you can either manage your existing themes or add new ones. On the first page, you’ll see your installed themes and there will be a button giving you the option to ‘Add More’. There is a difference between installing a theme and activating it: an installed theme is simply a theme that’s on your server, while an activated theme is one that is currently live on your site. At the time of writing, a theme called ‘Twenty Sixteen’ is the default theme and that’s the one you probably have on your site right now. If you want to look for new themes, just click ‘Add New’ and you’ll be able to look other themes using ‘Search’ to find ones you like. You can do cross searches using the filter tools and that way find themes that – for example – are blue and responsive or white and just one page. Just click ‘feature filter’ to bring up this option. You’ll notice there’s also the tab along the top that gives you the option to look at ‘premium themes’. This is important as not all themes on WordPress are free. 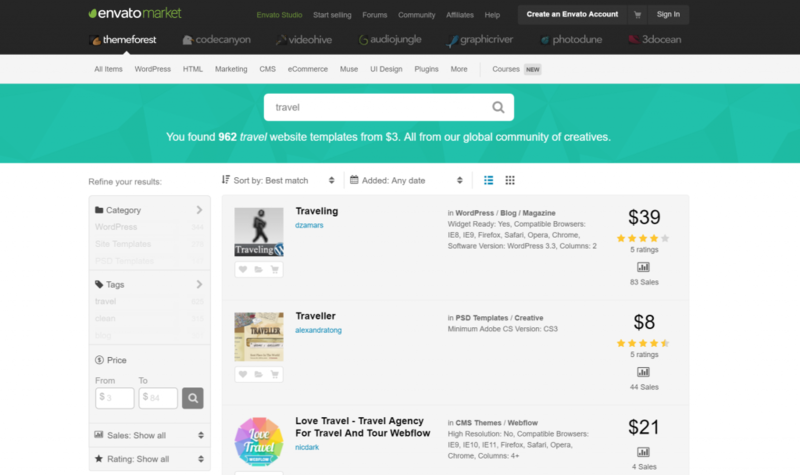 Some you’ll have to pay for but in exchange you do tend to get a slightly higher quality of theme/a theme that not every other website is also using. If it’s a more unique-looking theme you’re after though, then you should probably take a look elsewhere at the themes offered by other sites such as ‘Theme Forest’ (www.themeforest.net). 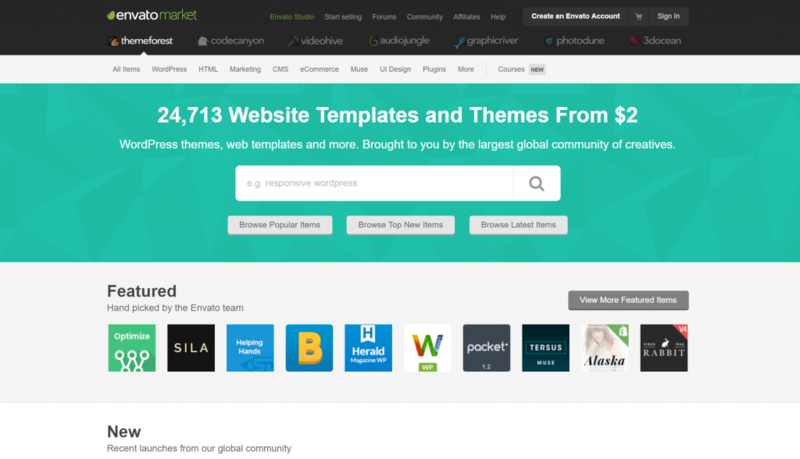 Theme Forest offers a bunch of paid themes (as well as templates for non-WordPress sites) and these will all be more unique and less common that those found on WordPress itself. In turn, this can help to give your site a more unique look and also help to make your blog appear more professional as a result. Theme Forest has a similar search functionality just like WordPress itself and this will allow you once more to narrow down the results to only those that meet your criteria. Try typing a keyword such as ‘travel’ into the search box and then use the options along the left to narrow this down to fit your budget or to include only those results with specific features that you require. Once you’ve found a theme you like and paid for it, you can then download the necessary files you need. These will take the form of a zip file and you can then upload them to install them. 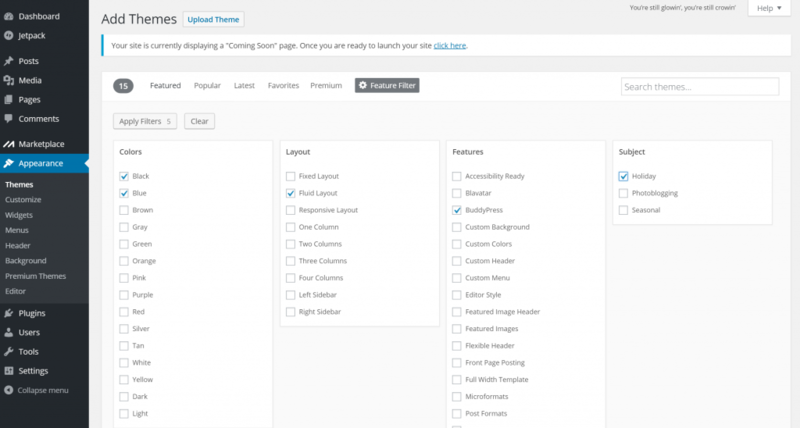 To do this, head back to the Themes page within your WordPress admin panel. Then look for the option along the top to ‘Upload’ and click that. This will take you to a page where you can choose a file and that in turn will allow you to very easily upload whichever zip file you want for your theme. This is still a very easy process and you’ll have your theme up and running in no time. Note though that you’re going to need to make a few changes in order to make the theme more customized to your blog and to your brand. Still though, there is one more option when looking for themes and that is to build something from scratch or hire someone to do it for you. If you plan on running a huge blog and you’re investing thousands of dollars into content creators, marketing etc., then it is advisable that you should have a theme that is unique to your site and that your visitors won’t see anywhere else. Creating one from scratch is the only way to do this and this will also give your site the necessary flexibility to perfectly meet your requirements, your branding and your tone. But creating a theme from scratch is hard work/expensive and with so many amazing themes available for free or for a small fee, there’s no reason for most people to do this right away. Download a theme you like from WordPress or Theme Forest, make a few changes and customizations to make it really your own and then invest in a custom-built theme later on if you have the money. Now you know how to find new themes and install them, the next question is what new themes to pick. With so many options, where do you begin? A good WordPress theme should always be responsive. This means that the layout will be able to alter in order to match the size and shape of the device displaying it. For example, if you look at a website on a 21” monitor, then it should look big and spacious with everything nicely spaced out. But if you then take that same website and place it on a mobile phone, it needs to then be able to shrink down and look good on there too. That means the images will shrink, they’ll move to fit the screen and everything will be rearranged accordingly. A responsive design is one example of a mobile-friendly theme. However, there is more than that to mobile friendliness. For instance, a truly mobile friendly website should also have buttons that are large and good for touch rather than using small hyperlinks that can be fiddly to hit with a stubby finger. Likewise, a truly mobile-friendly site won’t have any drop down menus. Why? Because drop down menus tend to require either a very small arrow button, or they will need you to hover a mouse over them in order for them to appear. While Apple’s ‘force touch’ functionality is now able to fulfill some of the jobs of a mouse-over, this isn’t widely adopted yet and that means there’s no way for most users to access these elements on your site… cut them out! One more mobile-friendly consideration is Flash. A mobile friendly site does not use Adobe Flash because this isn’t supported by most mobile browsers. Thankfully, Flash has largely given way to HTML5 now, so you shouldn’t find that any themes really feature this anymore. Then again though, it can still happen so just watch out for it. How can you tell whether or not a site is going to be mobile friendly? There is one very simple solution which is just to load up the preview of the theme on a mobile device! 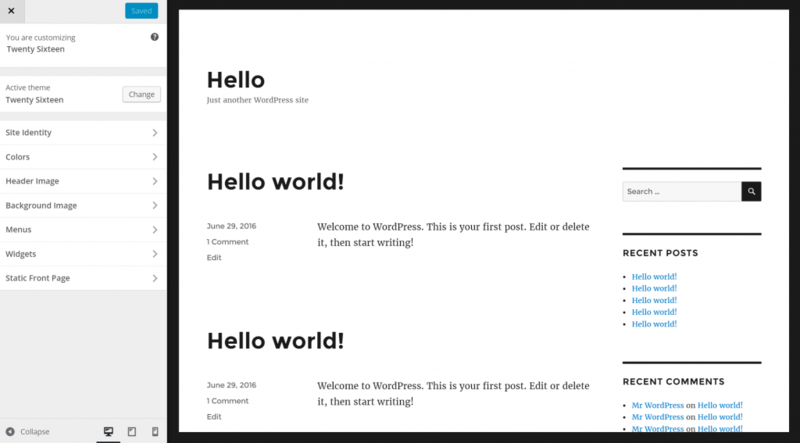 If you look at Theme Forest or even at WordPress itself, you’ll normally find that you can view a preview of the theme which will let you see what it will look like live. 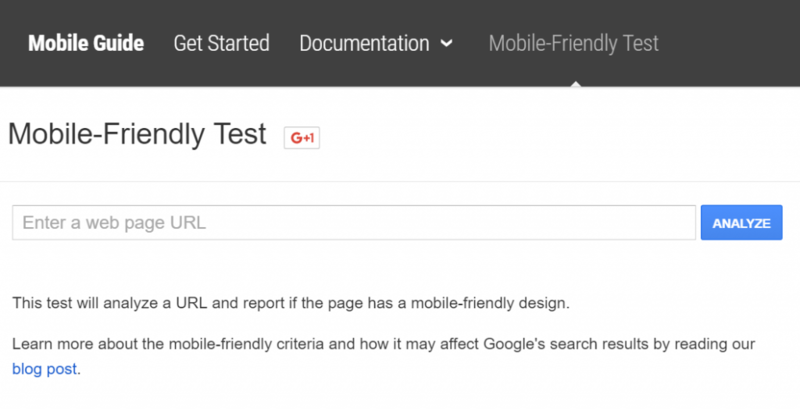 Another option is to use Google’s ‘Mobile Friendliness’ tool, which will not only let you know if a site passes Google’s idea of mobile friendliness, but will also let you know what the problem is and how it could be fixed. Get the URL of the theme you’re previewing and then just enter it into this tool. You’ll find this at www.google.com/webmasters/tools/mobile-friendly/. Having a mobile friendly theme is incredibly important and not something you can do without. Not only is it true that the majority of online traffic now comes through mobile, but Google now also makes a point of penalizing websites that are not mobile-friendly and that means that you won’t show up in mobile searches. And when you do, it will actually say ‘not optimized for mobile’ next to your listing! 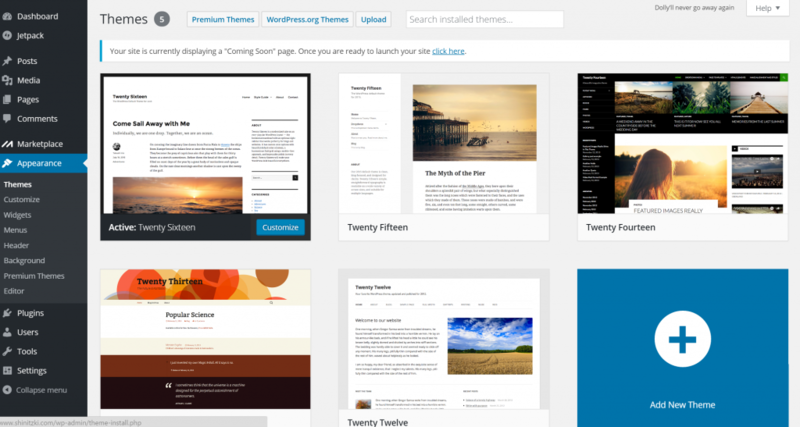 Another consideration is just how many features your theme has and whether it is offering everything you need it to. For example, some themes will support specific plugins that others don’t – so if you’re using a particular plugin then you need to be sure that the two will work in tandem! Likewise, different themes come with different customization options. This is very important because you might want to change your logo, change the background, change the text or edit the location/number of menus. The more customizable a theme is, the more unique you can make your site without having to fork out for a custom-built theme. This makes it a very good idea to look for themes that mention having a lot of different options for you to play around with. You also need to think about future-proofing. A more customizable site will last you longer because you can make changes without having to replace it entirely! Of course it’s also very important that your theme have a style and design that you approve of and that you think matches your site well in terms of the tone and the branding. One of the customizable features to look out for is color. You need to find out if the site theme has the option to change the color palette because this way, you’ll be able to alter it to match your logo and your own branding (not all do!). Chances are that you already have a logo in mind for your site and a visual language/tone. It’s important that the site either match that existing tone, or that you are able to alter it accordingly. The best option is to be able to change the colorscheme so that you’re using the exact color codes used in your logo. Another consideration is whether or not the layout and design look modern and have a professional sheen. Partly this will be down to personal opinion but it’s also important that it meet modern design standards and follows basic design rules. Likewise, it must be technically fit. 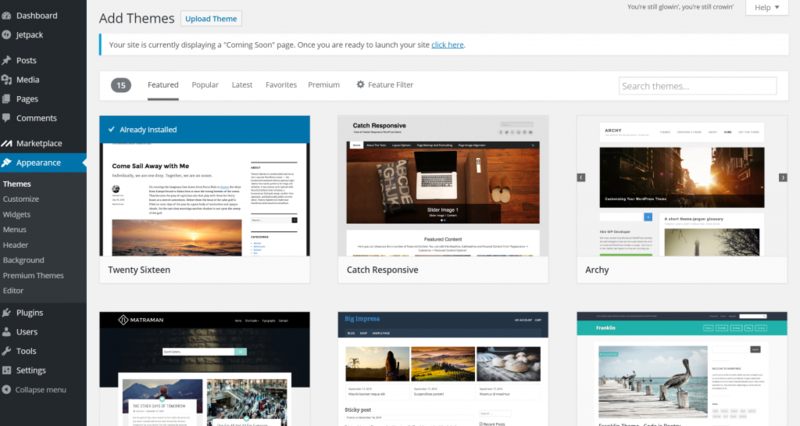 So all this means that your theme should avoid looking too cluttered or busy. Negative space is very important in design, so you want a theme that is unafraid to leave some areas empty. Likewise, typographic designs are currently very in-vogue and so too is ‘material design’ – meaning flat colors and icons and clues about interactions that come from the way individual elements move, are stacked or are shaded. A modern design should also look crisp with high definition edges and big HD images. Everything should be lined up and there should be no visible ‘mistakes’ anywhere. Finally, a good WordPress theme needs to load quickly and efficiently. If your visitors are left waiting around, then they may well think your site is just broken and leave without ever seeing it! But more than anything else, your theme should have that je ne sais quoi, that X-Factor, that you just can’t quite put your finger on. When you see it, you will know and from there it’s just a matter of making sure that it meets these other requirements as well.